The Android Market has 100 000 apps, AndroidAppolo introduces the top 0.5% that’s actually worth installing. The guide to the top Android apps on TechCredo has been updated, expanded and enhanced and turned into AndroidAppolo.com. All apps on the new site are handpicked, carefully selected and tested. Each app has a mini review, and if a demo/review video is available for the application, it will be displayed as well. 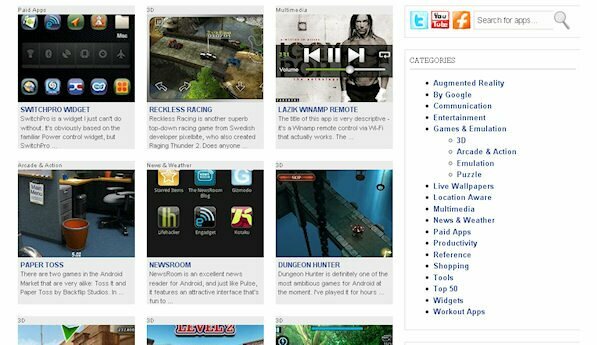 No bad software is allowed: the site features the best apps, games, widgets and live wallpapers Android has to offer. It’s much easier to see what’s new in the guide, since all apps are listed in the order they were added. The front page will always list the most recently included apps. A search box that lets you search for apps or a type of app. The top paid apps are now included as well. Improved categories: let’s say you want to see a list of the top 3D games for Android – simply click on the 3D category in the sidebar and they will be displayed. More demo and review videos. Videos are showed right under each mini review, instead of in Thickbox pop-up windows. QR codes for all apps displayed next to them for easy scanning. An option to install apps via AppBrain. A 3D tag cloud with the most frequent tags. An RSS feed so you can read about new apps in your favorite news reader. Twitter updates when a new app is added. Head over to AndroidAppolo.com if you want to give the new site a spin.